picasa web albums – Page 2 – Learn Picasa and Google Photos! Although Google+ Photos has now given us a way to view a slideshow of our photos, I still see no way to grab that slideshow and put it into a Blog or other website. But, that feature is still there if you use the Picasa Web Albums interface. Make sure you are logged into the Google account that has the album you’re looking for, then point your browser to https://picasaweb.google.com/lh/myphotos?noredirect=1 You should now be seeing all your photo albums in the Picasa Web Album interface (and it won’t redirect you,) even if you have a Google+ account. Click on the Album you want, then you will see some options at the right. Click on ‘Embed Slideshow’. Now you will be seeing some options for your slideshow. Choose the size you want, and choose whether you want captions to show. Then copy the HTML code from the bottom box. Now, come back to your website, or Blog, editor and make sure you are in the HTML or Source view. Then paste the code at the location you want the slideshow to appear. It will look something like the image below. Notice that it starts with <embed and ends with embed>. When you go back to your normal editing view, you will see the slideshow rather than the code. A wonderful thing about using this slide show feature is that it is a live link. If you add more pictures to the album, they will show up in your slide show on your website or blog. Same thing if you delete them. You might even use this technique for a constantly updated set of pictures on your home page. If you don’t have a website or Blog, you can learn to make one with Geeks on Tour tutorial videos on how to make a Blog/website. It’s so easy! And Blogger is completely free. Go to the Blogger Learning Library on GeeksonTour.TV. The first 3 videos are free for you to watch. To view the rest of them, you need to be a Geeks on Tour member – it’s only $7/monthly, or $58/yearly, or $68 for one year. Geeks on Tour is a membership website with hundreds of Tutorial Videos on topics of interest to travelers, such as managing digital photos with Picasa, using Android Smartphones, Route-Planning with Streets and Trips, and sharing your travels with a website using Blogger or with friends on Facebook. You can subscribe to our free e-newsletters, or become a paid member and be able to view all of the videos in the Learning Library. 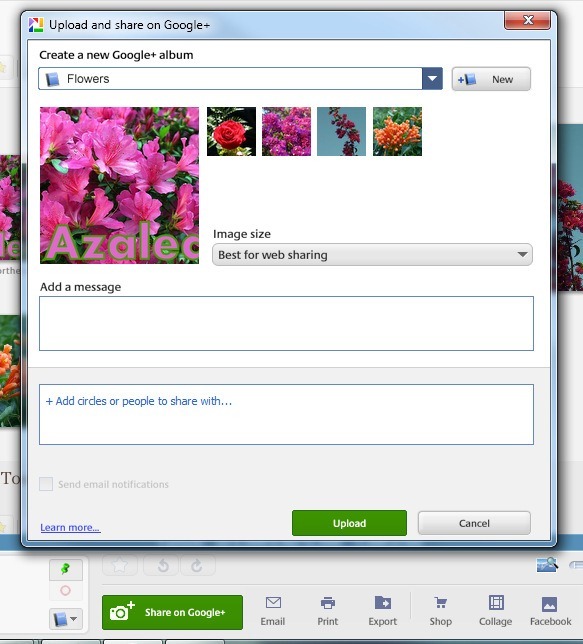 One of the great features about sharing your photos with Picasa Web Albums has been the ability to simply send your friends a link to your album and they can view a slideshow of your photos. Then Google added Google+ as the preferred way to view your photos … see this past article: What Happened to Picasa Web Albums? There are some nice new features like online photo editing, automatic cell phone uploads, and unlimited storage, but one missing feature was simply unacceptable to many – the ability to view your pictures full-screen in a slideshow. Good News! Google+ Now has Slideshow! When you’re viewing a photo album in Google+, you need to click on one picture. When you’re viewing that one picture, you will see a slideshow option in the lower left. If you click on the image below, it will take you to my photo album so you can try the slideshow feature. What happened to Picasa Web Albums? Picasa Web Albums is still there, but with Google entering the social networks game with Google+, the Web Albums are caught in the middle. Pictures are the number one things that people want to share using social networking sites. Google is trying to transition from Picasa Web Albums to Google+ Photos, leaving Picasa Web Albums in tact for those who choose not to join Google+. This transitional period is messy, and it’s changing daily. When I sat down to write this article, I was hoping I could make sense of it all and give you a nice, neat explanation of how it all works right now. I can’t. There’s just too much, and it’s changing too quickly. Your photos are being uploaded to one physical location. There are two interfaces to view that one set of photos: Picasa Web Albums and Google+ Photos DO NOT delete pictures from one and expect them to still be there in the other – your online pictures only exist once, if you delete them using either interface, they’re gone. Think of it like separate parents with joint custody. 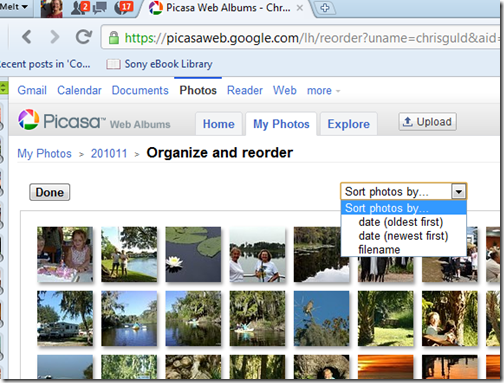 Both Picasa Web Albums and Google+ Photos have joint custody of your uploaded pictures. When you’re using Picasa Web Albums, you have all the PWA features like slide-shows which are not yet implemented in Google+. 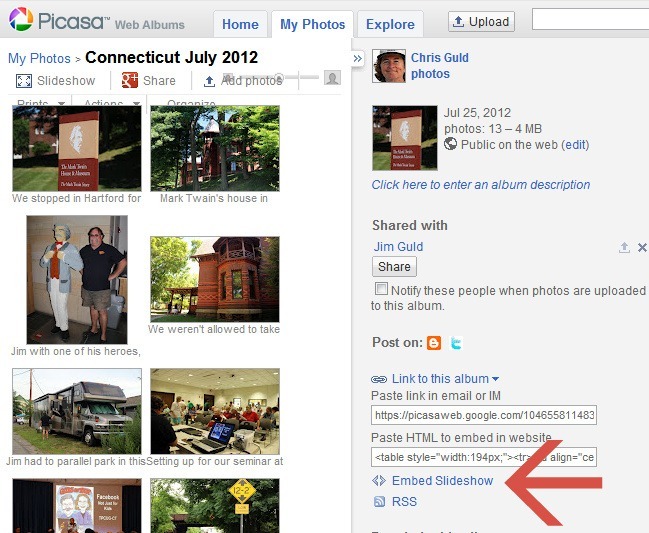 If you haven’t joined Google+ then you will only have the Picasa Web Albums interface available to you. Nothing has changed except the button in Picasa 3.9 is now green and reads ‘Share’ rather than ‘Upload’ as it was in PIcasa 3.8 – see screenshots above. Using Picasa 3.8 on your computer, the button is called ‘Upload’ and you will be using the Picasa Web Albums interface whether you have joined Google+ or not. 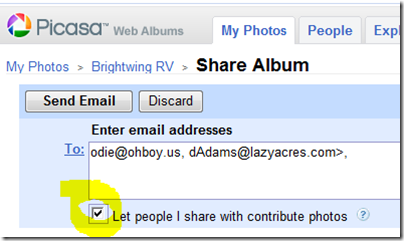 Using Picasa 3.9 and Google+ to create an album viewable by anyone with the link: If you don’t ‘Add circles or people to share with..’ then you are just Uploading – not sharing on Google+. The album created will be private. Then you can go to the album on Google+, click on Options and change to ‘Share Album via Link.’ This is the equivalent of Picasa Web Album’s visibility property of ‘Limited, anyone with link.’ (see member tutorial video: Picasa 3.9 and Google Plus Sharing) If you want to join Google+ but you want to keep managing your Web Albums the same way you did in Picasa Web Albums – by sharing links – then this is the technique for you. Image Size and Unlimited Storage: Using Picasa 3.9 and the Share button, if you leave the image size at ‘Best for Web Sharing’, then you have unlimited storage for free on your Web Albums. Specifically, any uploaded picture under 2048 pixels (aka ‘Best for Web Sharing) doesn’t count toward your 1GB of free space. Choose ‘Delete Google+ Content’ and then click the button Remove selected services. That’s it! Any content you added to Google+ will be gone – but your pictures will still be there. Remember? Picasa Web Albums had ‘joint custody’ with Google+. If you remove Google+, Picasa Web Albums now has sole custody again. 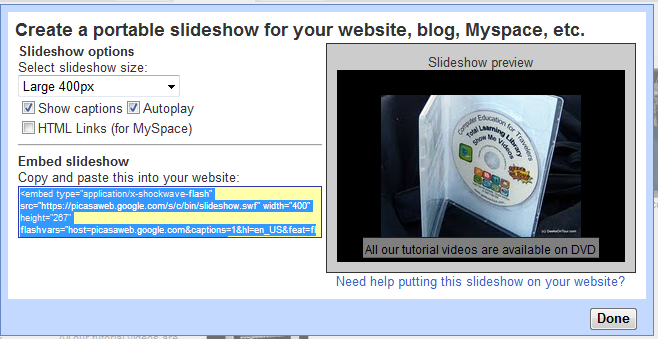 For more details see member tutorial video Removing Google+ to use Picasa Web Albums. This video takes an existing Google account and adds Google+, showing what happens to the Web Albums. Then it removes Google+ and shows the results. If you used Picasa Web Albums like I did … to house photos that I shared with friends via a link (or to embed in blog) … then there’s no reason why you can’t join Google+. The text in blue above, #6, explains the procedure I follow to maintain the same functionality. Some people really like Google+. It is a lot faster on my smartphone (and Android i.e. Google phone!) than Facebook. I really like how it allows me to automatically share my Blogger (also Google) blog posts to all my Google+ friends. And, the new ‘Local’ feature I expect will be very handy for finding friends’ reviews of favorite eating places and other businesses. To upgrade, or not to upgrade, is that your question? There are definitely some features worth upgrading for! And that is what I’ll talk about in this article. However, your pictures are precious, and any upgrade can have it’s problems on some people’s computers so what do you do first? You better know the answer to this question! Already have a good backup of all your pictures? Ok, let’s go. You might be able to upgrade by clicking on Help and Check for Updates but more often than not, this won’t inform you about new versions. If it reports that ‘This application is up to date’ you can still update to version 3.9 by going to the website at www.picasa.google.com and click the big “Download Picasa” button. Follow the instructions to download, then install or Run. Be prepared to wait a bit, this is a bigger file than past versions. I found that the Run process took an abnormally long time and it had no progress bar showing – so, just be patient, it will finally pop up with the license agreement and, after you click ‘I agree’ and Ok the folder location, you’re almost done. In my last article about Picasa 3.9 I mentioned the differences in your opening screen, this time I want you to take a look at the effects. There are two more tabs-worth of effects. As usual with Picasa, they are simple click and maybe drag a slider bar or two to try them out. If you don’t like the effect, you can always Undo. The Lomo-ish effect looks more rich, vibrant and focused on the center while the edges are dark. If you read about Lomography you’ll find that it’s film photography with an old toy camera! The HDR-ish (High Dynamic Range) effect is kind of like Sharpen on steroids. In fact, I find that I need to move the sliders all toward the middle to lessen the effect a bit. But, I really do like the sharpness and contrast that HDR-ish can give. The picture on the left is my original, the right has added HDR-ish effect. This look comes from a slide-sandwich technique devised by Michael Orton. In addition to adding depth and richness to the photo, there’s some dreamy, blurring going on. I think these are my favorite new effects. The picture above demonstrates both ‘Vignette’ – the dark shadow around the edges, and ‘Museum Matte’ where you can define an inner and outer frame at specified width and color. There is also ‘Polaroid’ which adds a thick white border, and a simple border or drop shadow. And, here’s one that I doubt I’ll ever use, but it might be a lifesaver for some folks – Invert colors can be used to make a negative be positive. All the above images come from using the new feature of side-by-side editing. You can put one picture up on the screen twice and apply editing features to just one of them to see the difference. You can also put two different pictures on the screen side by side. Very easy, and very useful! If you use Albums a lot, this might just be the one feature to make it worth upgrading! In the past, I’ve had to caution users, and explain in depth how Albums are a Picasa-only feature. 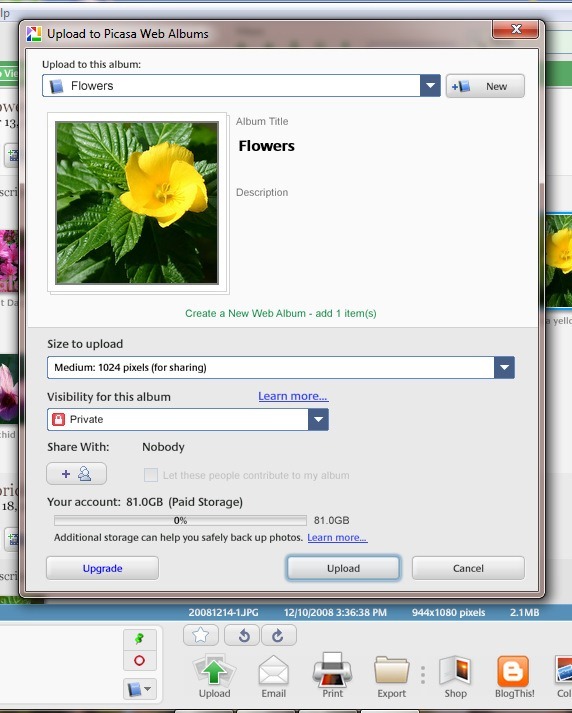 If you copied your pictures to another computer without using PIcasa’s backup and restore, for example, you would lose your album definitions (not the pictures themselves – just the album groupings). Now, in 3.9, album definitions are stored in the same picasa.ini file as all edits – right in the same folder with the pictures. So, if you move a folder of pictures to another computer, then install Picasa, it will be able to read the album designations from the Picasa.ini file in the folder, and recreate your albums for you. Woo Hoo! One less thing to worry about. 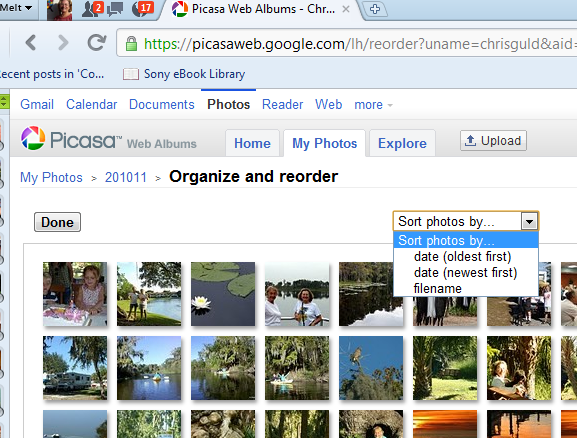 Realize that Picasa Web Albums is on the web. It is a companion to Picasa on your computer that you can choose to use or not. If all you do is use the Picasa software for managing the pictures on your computer, then the change from Picasa Web Albums to Google Plus Photos doesn’t affect you at all. If you do use Picasa Web Albums – which requires a Google account – and you’ve never linked your Google account to Google Plus, then nothing has changed for you. When you click the ‘Share’ button you will be sharing on Picasa Web Albums. Google will continue to encourage you to join Google Plus, but so far as I can tell, you can just say no. I’m not sure how long this will be true, but if Picasa Web Albums does morph completely into Google Plus Photos, I doubt that sticking with an old version of the Picasa computer program will make a difference. Google is on the move and we can’t stop them – I can’t anyway. It makes a lot of sense for Google to be rounding up their successful products like Picasa and Blogger and bringing them in under one company umbrella like Google Plus. Google is giving us these amazing products for free, they deserve to have their brand on them. So, my recommendation is to go ahead and upgrade to 3.9. It has some cool new effects, and one really important change under the hood with Albums. Things are changing with Picasa Web Albums, but you don’t have to participate if you don’t want. Hey, you can even use Picasa and just share photos online with Facebook, or Flickr, or PhotoBucket. But, if you go along with Google, you might even find you like Google Plus! I’m still just hoping they improve the Folder/Collections sidebar! Geeks on Tour is a membership website with hundreds of Tutorial Videos on topics of interest to travelers, such as managing digital photos with Picasa, Route-Planning with Streets and Trips, and sharing your travels with a website using Blogger or with friends on Facebook. You can subscribe to our free e-newsletters, or become a paid member and be able to view all of the videos in the Learning Library. Several articles in this website preach about backing up your pictures from your computer. (Picasa Tip: Why I Backup to CD/DVD, Have you Backed up your Pictures Lately?, Backp! Backup! Backup!, Don’t Delete your Original Photos) This article is about how you can backup the pictures on your Picasa Web Albums. Even if you don’t use Picasa Web Albums itself, if you upload pictures to your Blogger blog, a Picasa Web Album is created to store all those photos. This gives you even more reason to back it up! If you’ve been using Picasa Web Albums and/or Blogger for a while, it is very important to backup your online web albums to your local computer. Why? Because they may get accidentally erased online. I’ve been reading a lot lately about people accidentally erasing their web albums when they start using Google Plus for example. As I explained in my last Picasa Tip about version 3.9, your Google Plus photos and your Picasa Web Album photos are one and the same. Lucky for you, you read this blog! So, you know that, if you delete an album from Google Plus Photos – you are deleting your Picasa Web Album, and you won’t do it … right?! Even if you know that, there may be other reasons that you mistakenly delete one of your albums, or that Google mistakenly marks your account as spam and deletes your whole account! For these, and other unforeseen reasons, it is important to make an archival backup of your Picasa Web Albums. See this cute little video from the team that creates Google Takeout – from the Data Liberation Front for an introduction. Notice, in my case, I have 6,134 pictures for a total of 2.7GB, so don’t try to download this to your computer when you’re using a limited bandwidth Internet connection! The first step is all completed online – it ‘builds’ a package of all your web albums. It finishes the package by ‘zipping’ it. So the actual file to be downloaded is less than the sum of all the albums, but it’s still large. When it’s ready, you’ll see the word ‘complete’ and there will be a button to Download the .zip file to your computer. These downloadable zip files stay available in your Google Takeout account page under the heading ‘Downloads.’ I don’t know how long they stay there, so you do want to Download them to your computer as soon as you have a good Internet connection. Once you click download, you can navigate to the location where you want it stored, and you can change the name of the .zip file if you like. Once it’s downloaded, you can look inside the .zip file just by double-clicking. Notice that the albums are listed just like folders, and you can see the .jpg files inside. This means that if you ever needed to get any of these pictures back, you just unzip the file (right-click and ‘Extract All) and you’ll have the actual pictures. It’s not a special backup that requires a special restore. Then, breathe a sigh of relief knowing that all your Picasa Web Albums are safe and sound on your computer’s hard drive in case anything should happen to them on the web. 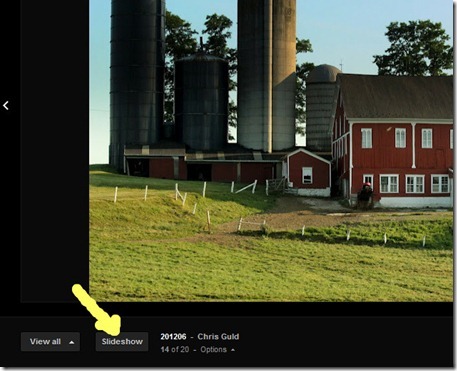 Added ability to upload to Google+: share with circles, post pictures to your stream, and upload images at original size. Social Tagging: name tag people in your Google+ circles and notify them via G+. Side by side editing: compare two pictures side-by-side, or compare different edits on the same picture. Updated RAW support for pictures from newer cameras. On the Tools > Experimental menu, we’ve added support for migrating your database to another local drive. Improvements to Face Movie maker: number of photos included, chronological ordering. Sync now uploads unshared albums privately. Improved restoring of virtual albums when you uninstall and reinstall, or move to a new computer. 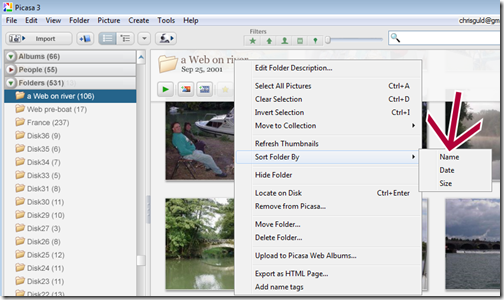 Album data is written to the picasa.ini file now, along with all of your other edits. OAuth support: use 2-factor accounts without getting an application-specific password. Picasa 3.9 toolbar with all the buttons restored. I’m not quite sure why Google removed all the buttons in the first place – maybe they have some future plans for that space?! If you don’t want to put them all back, you can still access the features via the menus. Basic and fancy editing right with the picture all online. When viewing a single photo in Google Plus Photos, you have a new ‘Edit Photo’ button. It gives you immediate rotate and auto-fix options and then a really cool ‘Creative Kit’ which takes you to a Picnik-like web-based app where you can crop, fix lighting, add text, add clipart, and even give yourself a tan! The big difference with this online editing tool, and the Picnik tool that you get with Picasa or Web Albums is that all the options are free, there are no ‘premium’ features. More storage space for your pictures. Pictures of 2048 pixels and less are always free on Picasa Web Albums and Google Plus. If you upload using Google Plus your pictures are automatically resized to be under that limit, in essence giving you unlimited picture storage. Beautiful new collage-style display of album pictures. In Google Plus Photos, when you open an album, you’re greeted with a collage of your photos, when you hover your mouse over any one it enlarges. More control over sharing. Some people who view Google Plus Photos for the first time are distressed over their perception of how the pictures are shared – thinking that everyone on Google Plus can now see their photos. Actually, you have much greater control with Google Plus Photos than you did with Picasa Web Albums. What gets some people upset is that, in Google Plus Photos, people who you share a photo with can also see who else you shared with. See Google’s information on the difference between Picasa and Google Plus Photos on ‘Who can see the people I’ve shared with? One thing I was SO hoping to see in this new release was a re-design of the Collections sidebar – the left side where you see the lists of all folders, albums, people, etc. I think this area is very confusing to people and needs a redesign badly. Here’s my previous article on the topic: Picasa, I Love You, Now Change! In next week’s Picasa tip, I’ll cover the cool new editing features and effects that have been added to Picasa 3.9. I will also have some tutorial videos coming soon for Members of Geeks on Tour. Geeks on Tour members have been discussing Picasa 3.9 in our forum. Check it out. Geeks on Tour is a membership website with hundreds of Tutorial Videos on topics of interest to travelers, such as managing digital photos with Picasa, Route-Planning with Streets and Trips, and sharing your travels with a website using Blogger or with friends on Facebook. You can subscribe to our free e-newsletters, orbecome a paid member and be able to view all of the videos in the Learning Library. 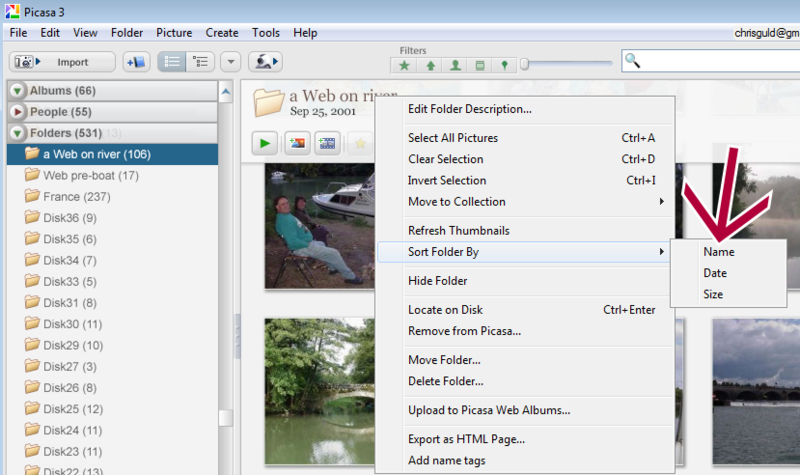 Picasa gives you three options for sorting pictures in folders, Name, Date, and Size. To see these options, right-click on the folder and choose ‘Sort Folder By.’ I usually choose Date and that shows my pictures with the earliest pictures first and as you scroll down you see later photos. Hopefully, if you’ve read our Picasa book, or watched the Videos, you already knew how to do that! What you may not know is that all three of those options can be reversed. Name, instead of meaning A-Z, can be sorted Z-A, Date can change from chronological to reverse chronological, and Size that normally sorts ascending (from small to large) can be changed to sort descending (from large to small.) How? By holding down the shift key when you click on any of the 3 options. Members may want to view the following tutorial videos. Not a member? Join now. 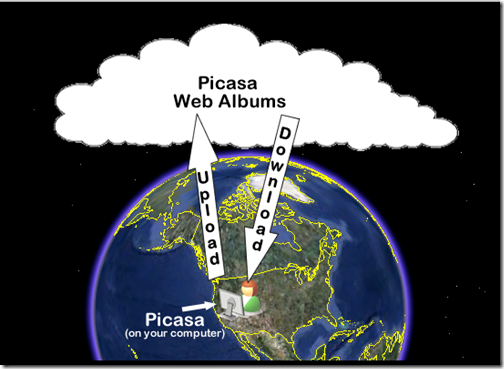 If your projects, products, or services can be shown in a picture – I think Picasa web album is your answer. Just get a web person to build you a simple, one page website (or you can do this yourself) and embed a slideshow from a web album where you’ll put the pictures. 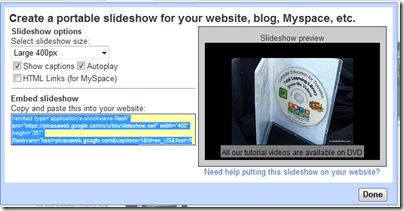 Every time you add a new picture, it will show up on the slide show on your web page. Don’t offer an item any more? Just delete the picture from the web album and it will be gone from your web page. Whatever you want to say about a product or service can be included in the caption of the picture. You’d be surprised how much you’re allowed to type. And, if someone looking at your web page clicks on the slideshow, they’ll be taken to your Web Album and see the pictures and captions full size. Here is an embedded slideshow from a web album with pictures of the products and services that Geeks on Tour offers. 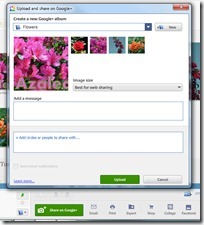 Log in to your Picasa Web Album and open the album you want to embed. Make sure to check the box to Show captions, autoplay, and at least 400px in size. The slideshow above is 600px. Go to the HTML code for your web page and paste the code in where you want the slideshow to appear. Now, any time you add, delete, or change a picture in that album – it will be reflected in the slide show on your web page. No need to call your webmaster and pay for revisions, just use the free tools that Picasa and Picasa Web Albums provides! Words do matter. If you ask a question and you use the term ‘Upload’ when the correct term is ‘Import’ you might not get the answer you were looking for! I see this all the time. Let me give you an image that helps me remember the meaning of Upload and Download. 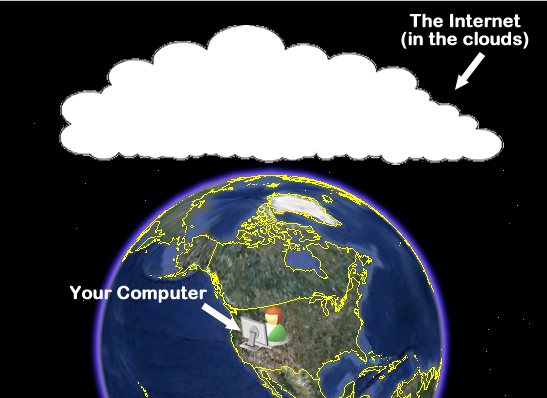 It is very useful to think of the Internet as existing in the clouds above the earth. In reality, of course, the Internet is made up of lots of computers and cables here on the ground, but since they are accessible without regard to space or time, it’s as if the Internet is a parallel universe above the earth. Thus the popular current terminology of ‘cloud computing’ simply means all the data your computer is accessing exists on the Internet instead of on your computer. ‘On the Internet’ and ‘In the Clouds’ have become synonymous. We also refer to this as Web-based. Picasa is software that exists on your computer and manages photo files on your computer. Picasa Web Albums (PWA) is a photo-sharing website. It exists on the Internet, the Web, … in the clouds. To ‘Upload’ means to copy from Picasa to Picasa Web Albums; to ‘Download’ means to copy from Picasa Web Albums to your computer. The terms are not used just by Picasa. In general computer terminology ‘Upload’ simply refers to a direction … from your computer to the Internet. ‘Download’ refers to the other direction … from the Internet to your computer. Even if all you’re doing is browsing the web, upload and download activity is taking place. When you click a link, you are uploading a request to see something. Images you view on your browser are downloading to your browser. 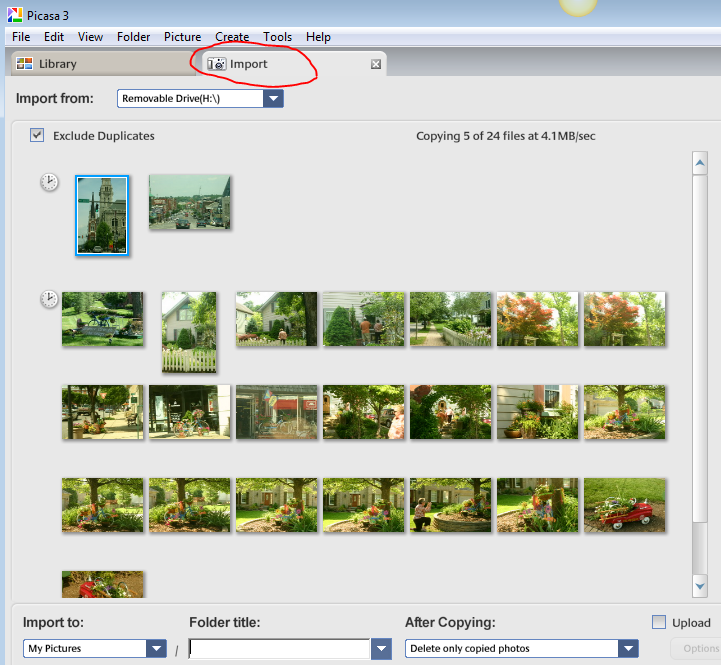 Picasa’s Import command is what you use to copy pictures onto your computer from some external device. That device is usually your camera, but it can also be a scanner, a USB drive, or even a folder on a CD or DVD. When you insert a camera card into your computer’s card reader (or attach the camera with a cable to your computer) you probably see a popup dialog box asking if you want to ‘Copy pictures to your computer using Picasa.’ When you click on that you are using Picasa’s Import feature. Import has nothing to do with the Internet. 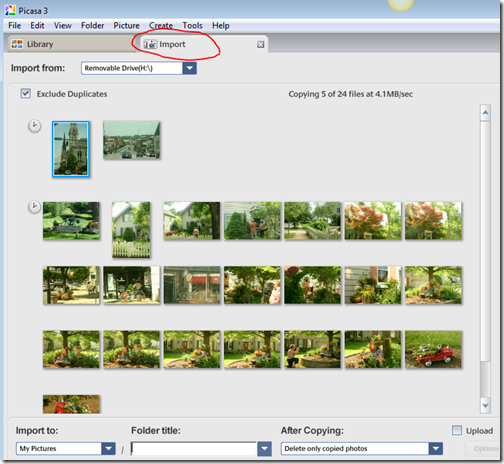 Import is Picasa’s tool for copying pictures onto your computer from whatever device has the pictures. You don’t even have to use Picasa’s Import tool if you don’t want to. For a long time, I preferred the import procedures on Canon’s ZoomBrowser. I would use that software to get the pictures from my camera to my computer. Once that was done, I would use Picasa to manage them. As long as they were somewhere within the My Pictures, Picasa would see them as soon as I opened Picasa. Import also has nothing to do with the relationship between Picasa and pictures that are already on your computer. If you have pictures on your computer already and you’re not seeing them using Picasa, then you need to use the Folder Manager to make them show up. If you use the Import command to find pictures already on your computer and then import them to another folder – you will now have duplicates! Import = Copy. I belong to a club that has a lot of pictures of club events. I’ll bet a lot of you do too! There is one designated club photographer, but she isn’t always able to be at all events. And, at some events, it seems like everyone is taking pictures! How can we let everyone contribute their pictures to one central club web album? One person has to get the album started, logged in as the owner of the Web Albums. That person clicks on Share and enters the email addresses of everyone who has pictures to contribute. If the box is checked for ‘Let people I share with contribute photos’ then, those people will be able to upload photos to that album even though they aren’t the owner of that album. They are contributors. There’s one key to making this work right. and that must be the email address that was used for sharing. So, in the example above, if dadams@lazyacres.com does have a Google account but it uses the email address dadams@gmail.com, then the invitation must be addressed to dadams@gmail.com. Note: Not all Google accounts use @gmail.com, but all @gmail.com addresses are also Google accounts. If the contributors also use Picasa, then the process is just like uploading to their own Picasa Web Albums. You must be logged in to your own account – just like you would be to upload to your own albums. Simply select the picture or pictures to be uploaded and click Upload. 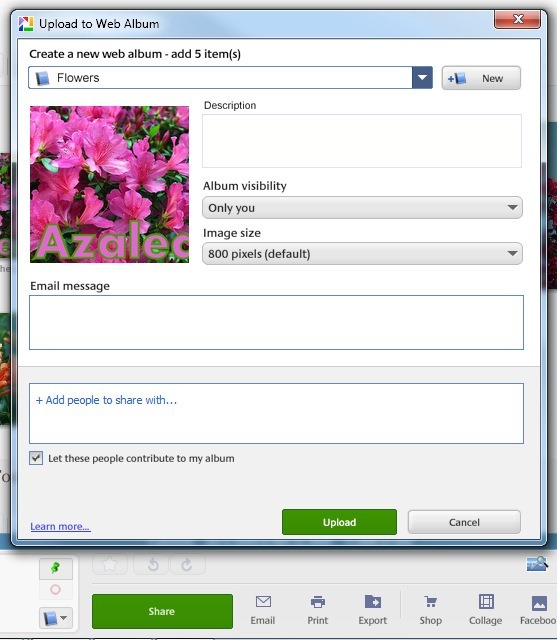 You will see the normal “Upload to Picasa Web Albums” dialog box, but when you click on the dropdown arrow under ”Upload to this album:”, you will see options to contribute to a friend’s album. Simply click the shared album you want and click Upload. 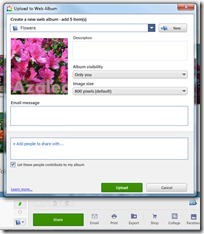 Next you will see a form to browse to your computer and select the photos you want to upload. Click Upload, and you’re done. So tell everyone in your group to take those pictures! Then they can share them with the group all in one Web Album. Note: only the owner of the web album can delete pictures. Both print and Kindle edition include 27 video lessons. Note: Many more videos available with a Geeks on Tour Membership!